Brenda Wang showing the brochures. DOHA: A group of over 50 volunteers from the five continents have come to Qatar to share the benefits of a plant-based diet in the context of the Qatar Sustainability Expo and UN climate change conference. Supported by Loving Hut, a restaurant chain from the US, they promote veganism, which is a vegetarian diet without eggs or dairy. The volunteers will distribute free food packets at the Doha Exhibition Center during the Qatar Sustainability Expo and hold workshops to let people know about the impact of meat consumption on climate change. Some of them work in Loving Hut, while others are just consumers of vegan food. They describe themselves as “travelers” who are confident of the good that veganism does to the environment. On this basis, they refer to studies which conclude that adopting a vegetarian diet for one year reduces more emissions than swapping a car to an eco-friendly vehicle. Brenda Wang, one of the volunteers, told The Peninsula that “research has proven that a vegan diet can reduce global biodiversity loss by 60 percent, reduce climate change mitigation costs 80 percent by 2050, and prevent and reverse deforestation”. 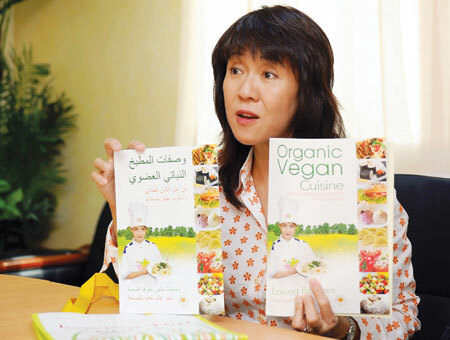 “With this visit to Doha, we want to give locals a chance to learn the benefits of the vegan diet and how to cook it. The vegan diet prevents cancer, and helps in cases of diabetes or obesity. It also lowers blood pressure, cholesterol levels, and strengthens the immune system”, Wang added. During the Conference of the Parties that will take place in Qatar from November 26 to December 7, various workshops will be held about this issue, two of them led by Gerard Wedderburn-Bisshop, executive director of World Preservation Foundation. This expert will talk about greenhouse gases and possible solutions. A third workshop will address “the most powerful tool to reduce deforestation and pollution: change the global food system”. In addition to the workshops, Loving Hut will offer vegan food at the Doha Exhibition Center during the conference, have professional educators and nutritional consultants at their booth and science-based presentations on veganism and climate change, among other activities. The principles of vegans revolve around compassion towards animals, which, they added, “are not on earth to be eaten”. Members of this group also participated in previous COPs celebrated in Copenhagen (Denmark), Cancun (Mexico) and Durban (South Africa). They’ll also take part in the Conference of Youth that will take place before the climate change conference in Qatar.